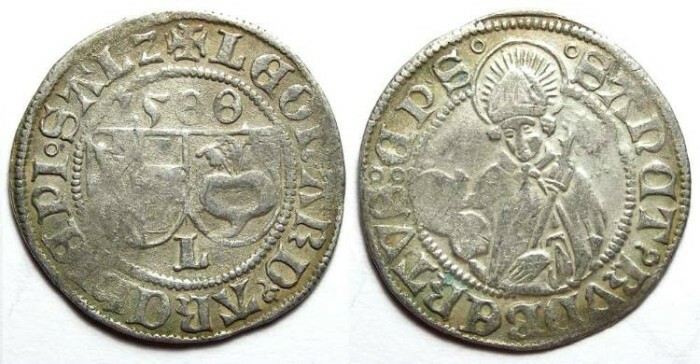 1500 is the last year of the 15th century, and thus type qualifies as an early (pre 1501) dated coin. However, it is possible this type was a frozen date and coins with date may have been struck as late as 1506. Size : 24.8 x 25.4 mm. Weight : 2.82 grams. Reference : Probszt #99. This type is not listed in Frey. Grade : Fine with typical minor weakness. Obverse : Arms, with the date 1500 above and LEONARD ARCHIEPI SALZ around, with an L below the arms. Reverse : Saint Rupert shown from the waist up, with SANCT RVDBETVS EPS around.